Salam alaykum! It has been a long but gratifying week. 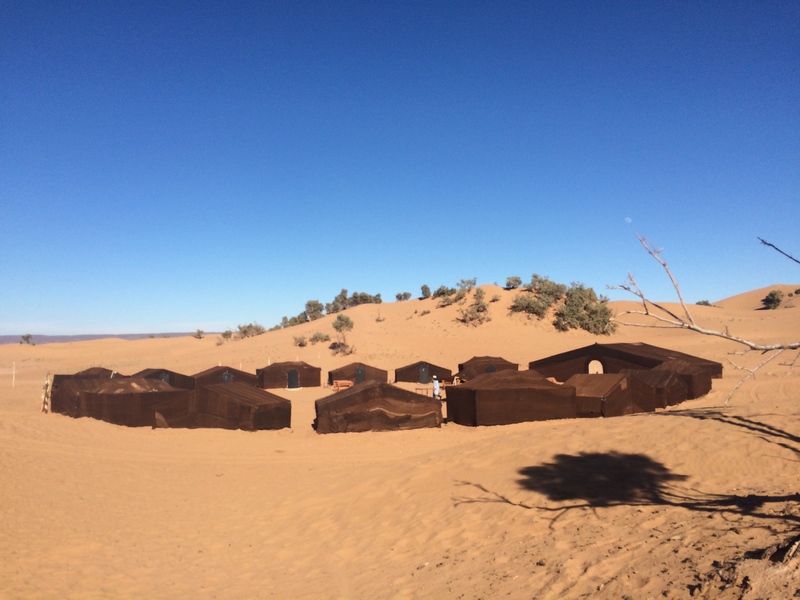 On Tuesday morning, bright and early, we boarded two buses to depart for our 5 day trip to the Sahara. Unfortunately, I was struck with a cold right before we left – very bad timing, but, geared with a handy dandy handkerchief and a week’s supply of DayQuil, I was ready to go. The first day was essentially just a travel day, as we had to drive for 7 hours to reach our first destination. The drive was through the Atlas Mountains, and thus probably the windiest road I’ve ever been on. 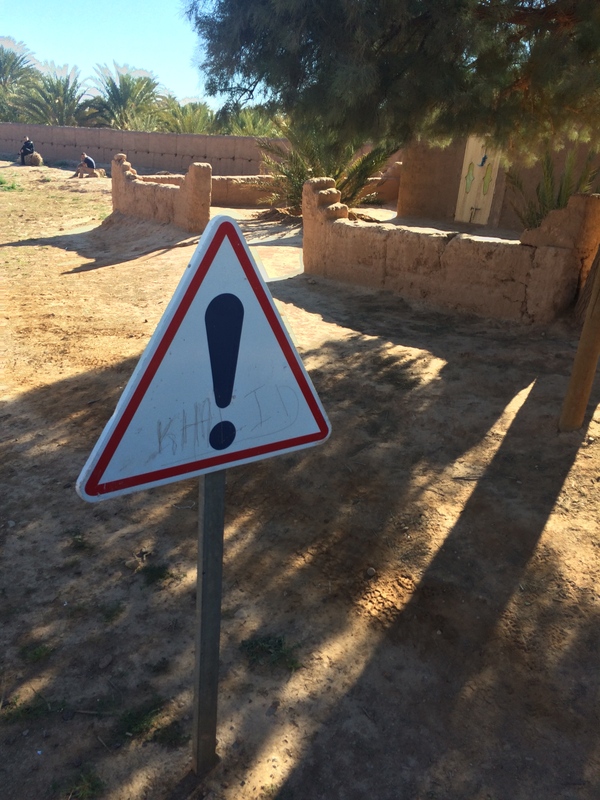 It was a bit treacherous, driving on a narrow road with steep cliffs – scattered with ominous signs with pictures of cars tipping over or sometimes just a simple exclamation point. Nevertheless, it was very scenic and beautiful. Luckily, I didn’t get carsick and was able to marvel at the amazing views passing by outside my window. The mountainscapes were often so unbelievable, they looked like a green screen. 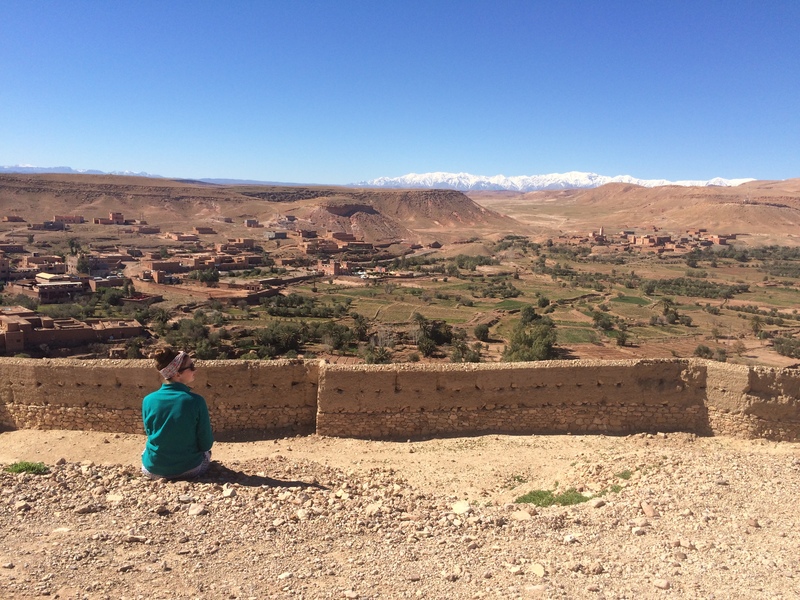 We broke up our drive by stopping for lunch and a hike at Ait Ben Haddou. This is a fortified city, or ksar, along the former caravan route between Marrakech and the Sahara, situated alongside the Ounila River. It has also been the filming location for many famous American movies, most notably Indiana Jones and Gladiator. And, most importantly, Game of Thrones! In GoT, Ait Ben Haddou becomes Yunkai, one of the cities in Slaver’s Bay that Daenerys visits. Our tour guide, who led us to the top of Ait Ben Haddou and told us some of the area’s history, said he actually got to be an extra in the making of the series. He said that the filmmaking industry is very beneficial to the area, as it brings in thousands of people and boosts the local economy. We ate lunch at a restaurant on the terrace overlooking the ksar. After lunch, we had one of our first art classes with a woman who flew from America to travel with our group for the week and teach us some sketching and watercolor techniques. It is fascinating to watch her work, but she definitely makes it look easier than it is – my pieces never seem to turn out nearly as beautiful as hers do. Nevertheless, it is a fun way to try and document our experiences here, and I succeeded in creating an amateur drawing of the city while munching on dates and tea after lunch. Afterwards, it was time to continue on our windy journey until we reached our destination for the night: Boutaghar, located in the Atlas Mountains. 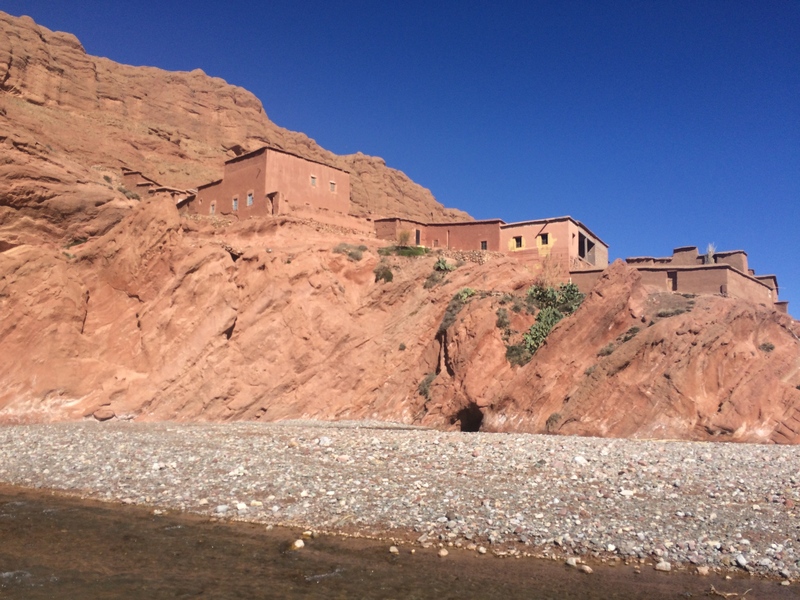 We resided at a hotel called “Raid Berbere” which our guides warned us would be “rustic.” We were all pleasantly surprised at the comfort of the hotel, which was perfectly nice, because they made it sound like it would be way more adventurous than it was. However, we definitely made a dent in the place – we managed to break all the toilets and make the electricity surge multiple times during our short stay. Unfortunately, traveling with a large group of 20 or so people usually means that we leave our mark wherever we go. On Wednesday, we had breakfast early at the hotel and then set out for an all-day hike. We hiked for about 7 hours or so, and about 10-12 miles according to our phones’ step trackers. The scenery reminded me a lot of Utah or Arizona, as we were surrounded by huge orange rocks everywhere. Much of our time was spent trekking through rivers, because we were hiking through a river gorge. 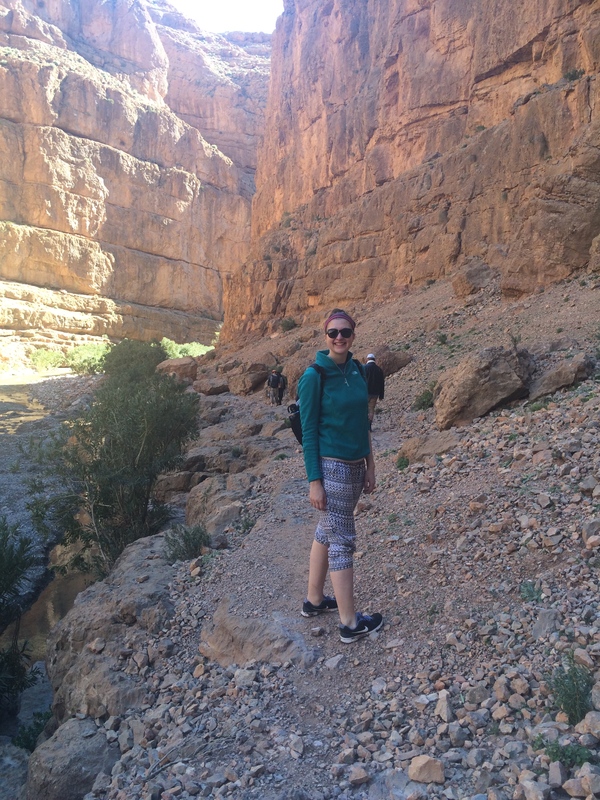 It was a bit cold and uncomfortable to do in tennis shoes (since I was unprepared and didn’t bring water shoes) but it felt refreshing in the heat. We had a “picnic” lunch midway through the hike, aka we sat on a bed of blankets and were fed hot mint tea, a beautiful array of fresh veggies, tagines of omelettes and fish, and some fruit for dessert. We had some time for a quick art lesson and then we were off to finish our hike. 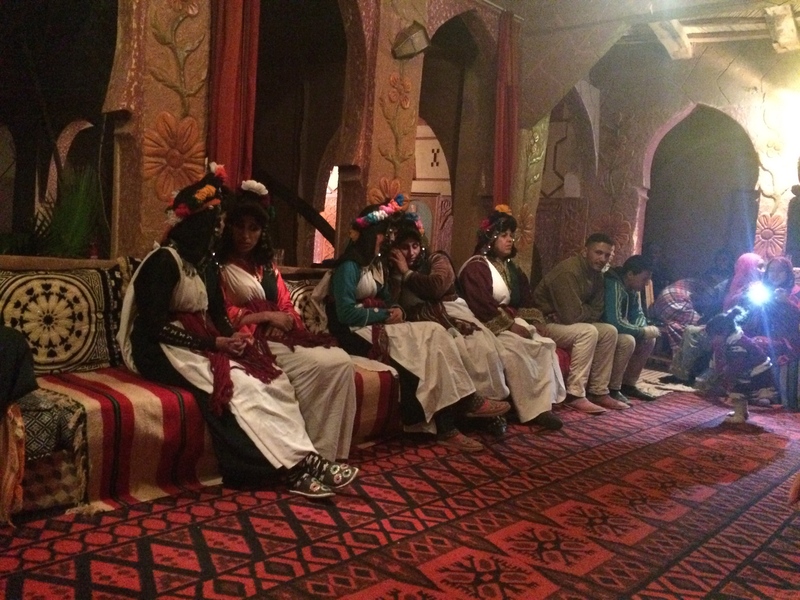 In the evening, we were treated to a show of “Ahwaash,” a traditional Berber form of dancing and singing. This consists of a group of male drummers in traditional outfits accompanied by some female dancers adorned in beautiful Berber dresses and headdresses. It was very fun to watch, and they even let us join in multiple times and give it a try! I didn’t get very many good photos because I was too busy enjoying the music and participating. Thursday was another day spent mostly traveling. We drove for about 6 hours, which didn’t bother me because once again there were beautiful views all around us, mostly the Ouad Draa (Morocco’s longest river). We had another “picnic” lunch halfway through the journey, as well as a watercolor painting class. 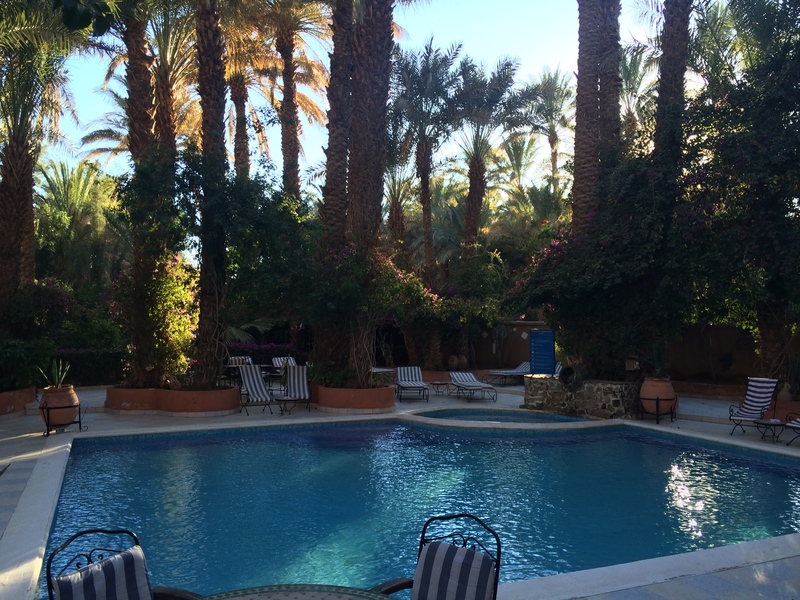 When we arrived in Zagora, our accommodations at Hotel Sirocco seemed like a dream. We were met by a beautiful pool, surrounded by palm trees and an outdoor cafe, hot showers, comfortable rooms, and a yummy meal in the lavish dining room. It was nice to have an afternoon to relax and gear up for our night in the desert. The next morning, we set off again for the final leg of our trip: M’hamid Ghazlane, on the brink of the Sahara, where we would meet our camels and start our journey into the dunes. Along the way, we stopped at Tamegroute and embarked on a mini tour of the ancient city. Tamegroute is the home to a famous ancient Quranic library, containing over 4,000 historic manuscripts. We perused the library with the help of an elderly man who has been its keeper for over 50 years. He showed us some of the books on display, which contained a plethora of knowledge from astronomy to geography to mathematics to medicine. Most impressive was a Qur’an on display from 1063, made from gazelle skin (and all handwritten in flawless Arabic calligraphy of course). We also saw the Zawiya Nassiriya, the famous historical center of learning and religion of the Nassiriya Sufi order, which was beautiful. 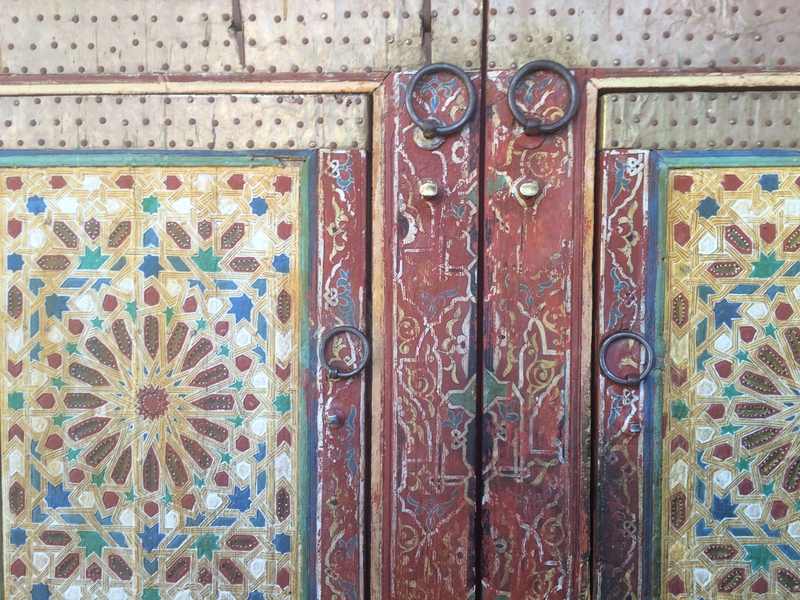 We all knocked on the multicolored mosaic door three times, since it’s said to be good luck! 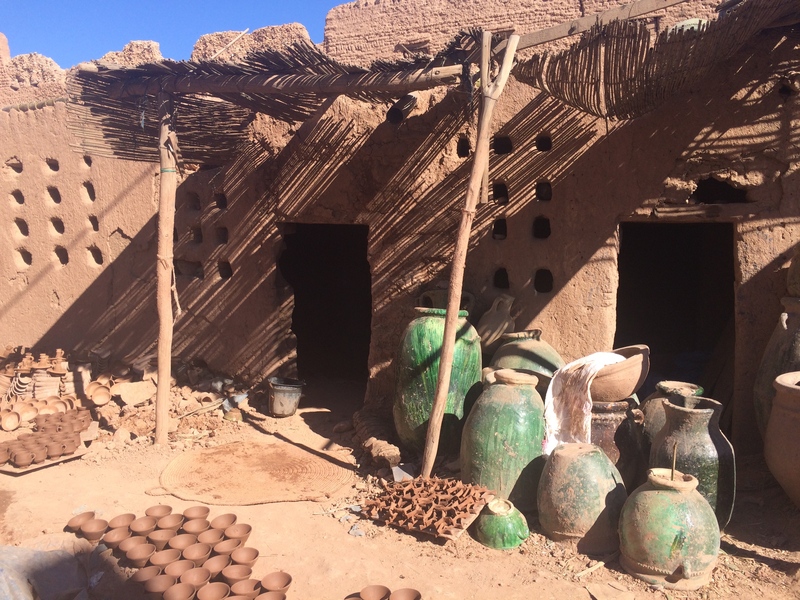 Tamegroute is also famous for its pottery production, particularly the green kind. We watched some potters at work and then had the opportunity to buy some of our own. Instead of having separate stores, the family all has one store and splits the profit to avoid competition, which I thought was really cool. I came away with some beautiful souvenirs and almost felt guilty for how cheap they were! Afterwards, we continued on our drive until we reached M’hamid Ghzlane. 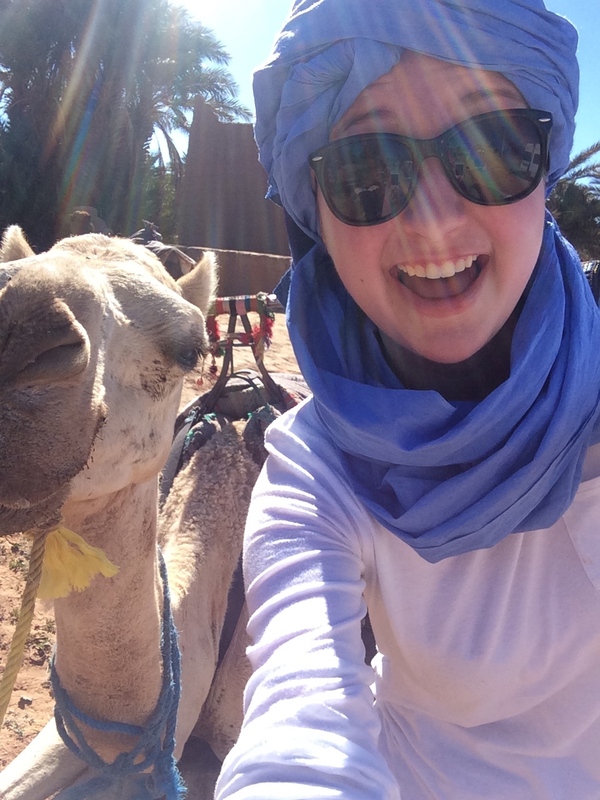 There, we learned how to wrap our heads with scarves to keep the sun and sand away and met our camel friends! Mine was named Aziza, which means “beloved.” After our little meet and greet we boarded our camels and off we went. Going into this trip, I was thinking that camel riding would basically just be like riding a horse, but with a hump (obviously). This was definitely not the case! Riding a camel was WAY more challenging than I thought it would be, not to mention the fact that I was about 10 feet from the ground. It was a bumpy ride but an incredible experience. Multiple times along the way, we were all marveling at the fact that we were actually riding camels in the Sahara desert. It seemed too awesome to be true! After a couple hours of riding, we reached our “campsite.” Once again, quotes are necessary because this was not the type of camping I’m used to. Maybe the term “glamping” (glamour camping) would be more appropriate: our site consisted of a circle of sleeping tents, complete with cots, pillows, and blankets, a little shady area with couches and pillows in the middle, a dining tent with fancy couches and chairs, and a bathroom with little sinks and stalls. 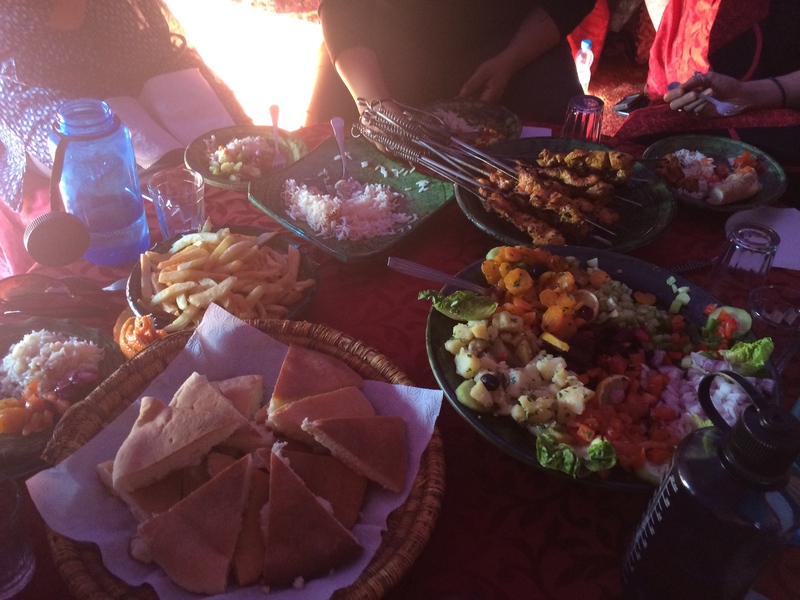 We feasted on a delicious lunch of rice, veggies, bread (always), chicken skewers, and french fries – yes, french fries in the desert. Pretty crazy to believe. 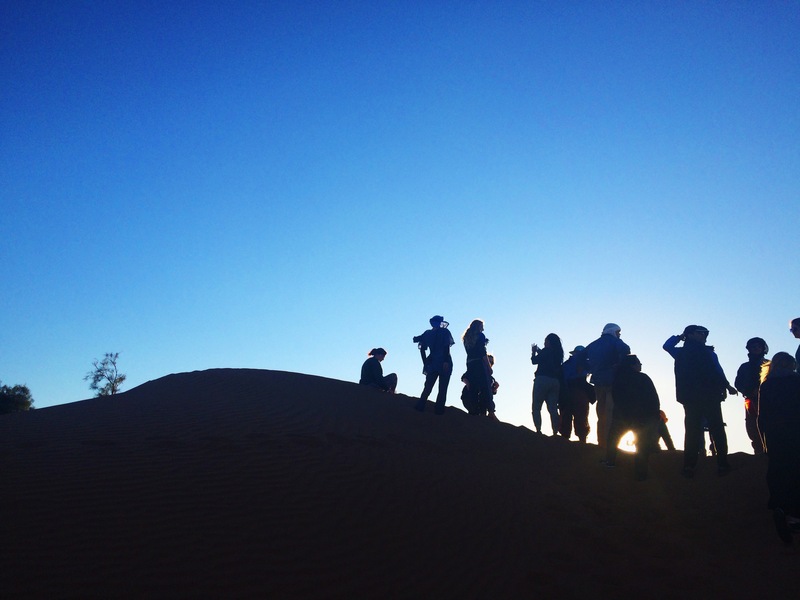 After lunch, we had another art class and then we went on a hike in the dunes – not an easy feat. Walking in the sand on the beach is hard enough, but when walking in large sand dunes is even harder! Many times when I was walking uphill I felt like I was running in place because I wasn’t getting anywhere, and going downhill my feet sunk into the sand almost up to my knees. 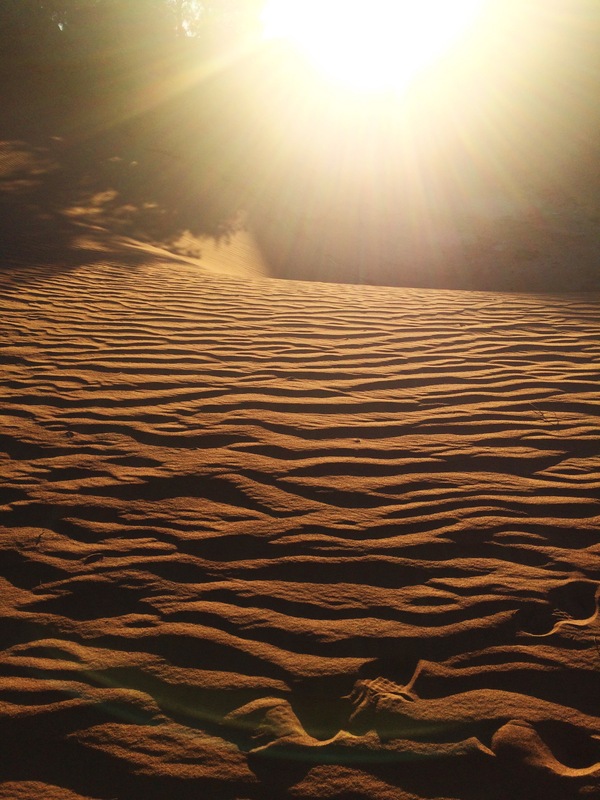 Nevertheless, it was once again incredibly beautiful, especially because the sun was going down as we were walking through the dunes. 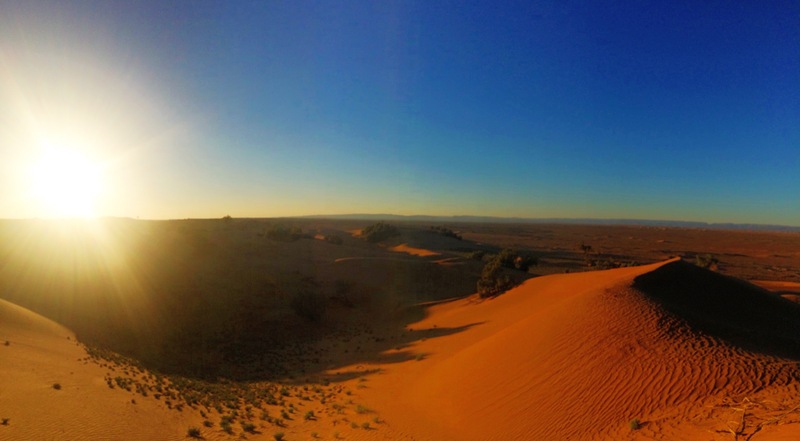 At the end of the hike, we climbed a huge dune just in time to sit and watch the sunset. 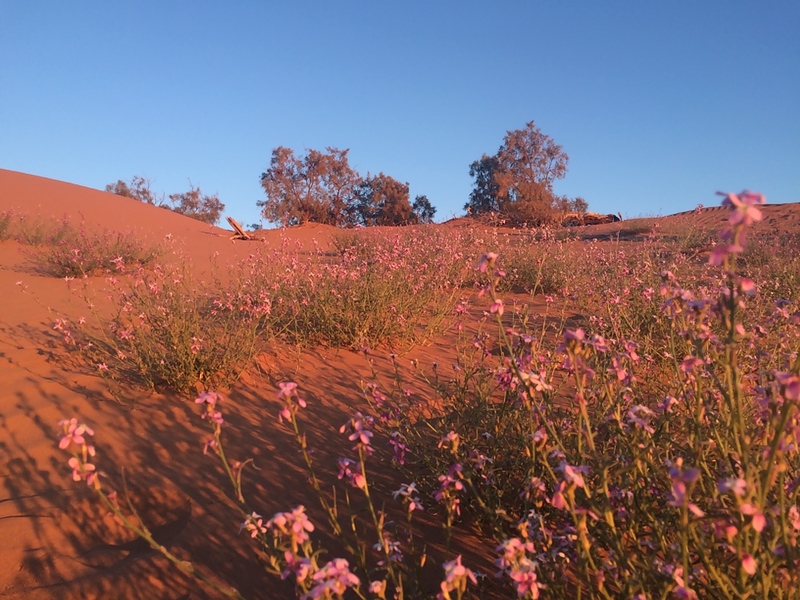 As far as the eye could see there were dunes of orange sand sprinkled with trees underneath a blanket of technicolor sky, blending from orange to pink to blue. 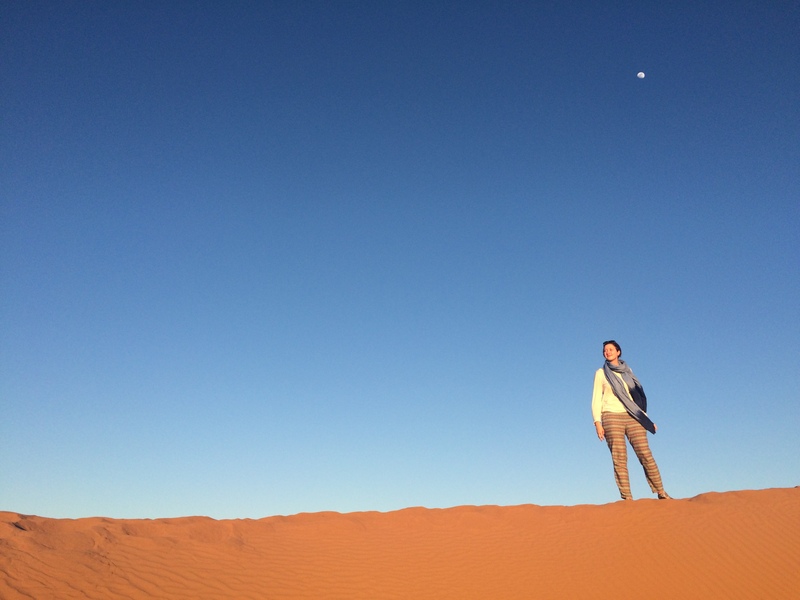 One of the most awe-inspiring aspects of being in the desert was just how HUGE the sky was – so big and open and blue. We decided to have a group moment atop the dune by screaming at the top of our lungs for 10 seconds, followed by 30 seconds of complete silence. This was very cathartic and relaxing, and much needed. After the sun went down, we all stargazed and swapped stories until it was time for dinner. At night, our guides built a bonfire and we gathered around to roast mini Haribo marshmallows (the only ones we could find at the Moroccan supermarche). 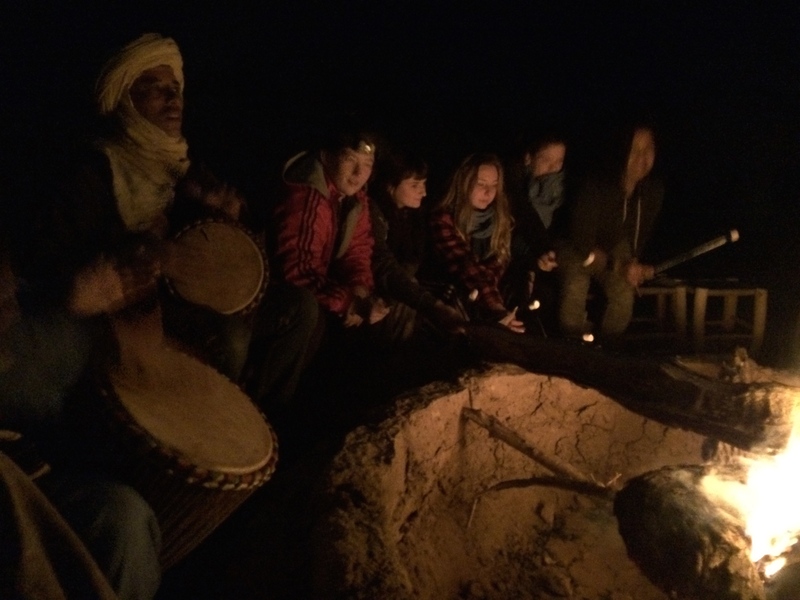 It felt like a taste of the Pacific Northwest, reminiscent of beach bonfires in the summer in Westport – except for the fact that our guides got out a bunch of drums and played some Moroccan songs, while everyone clapped and danced along. They gave us the opportunity to try it out, but we failed miserably so we let them keep playing their wonderful songs into the night. At some point, some men showed up who I don’t think were part of our original camp and just joined in and started singing and made an impromptu instrument out of something, like a metal tray or some skewer sticks. That’s probably one of the things I admire most about this culture: the sense of camaraderie and friendship wherever you go. Even though everyone warned me that it would be incredibly cold in the desert at night, I stayed toasty warm sleeping in my cot with all my layers and blankets. 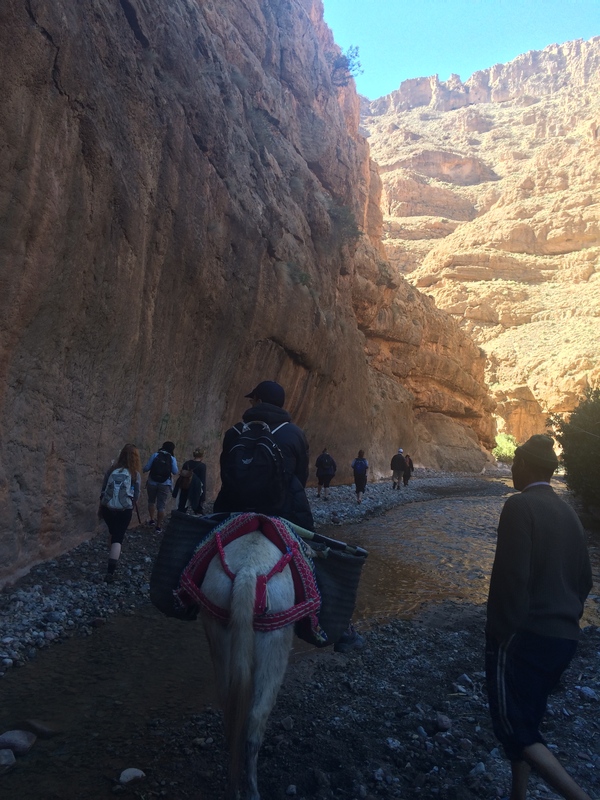 We woke up at sunrise and had breakfast, and then it was time to ride the camels back to the buses and return to Marrakech. I found that the camel ride the second time was much easier, although my entire body was (and still is) sore from the day before. If you want a good workout, just ride a camel! 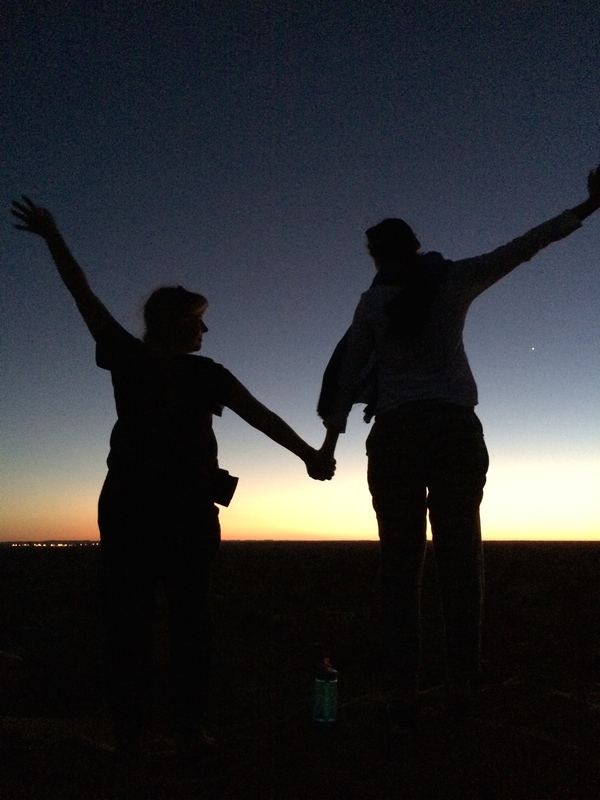 We had a loooong day coming home – we drove for 10 hours in the buses, only stopping for lunch and bathroom breaks. Everyone was very exhausted at this point and by the end of the bus ride we seemed to be getting a bit stir crazy. For some reason, I got carsick on the way home even though it didn’t bother me on the way there. 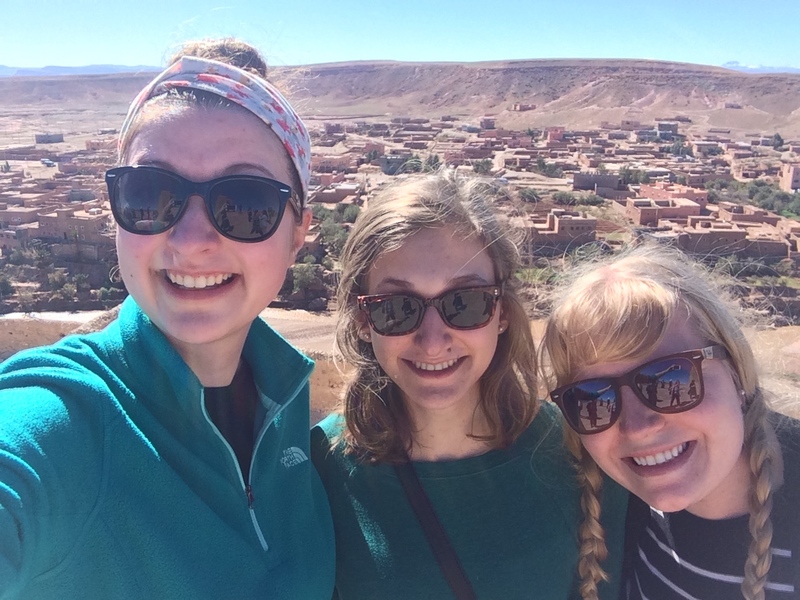 We reached Marrakech around 8:30 and I was met by my wonderful host family. I was very happy to see my room and get a good night’s sleep. Today I got to sleep in and relax, and visit the hammam to scrub away all the dirt and sand – a much-needed recharge after a long and exciting trip. I had a great journey but I’m happy to be home! I have the feeling that this will be one of the parts of this semester that will stand out the most, and it was an experience that I’ll treasure forever.